Brick Mayor John Ducey has been recognized as Humanitarian of the Year by The Arc of Ocean County. 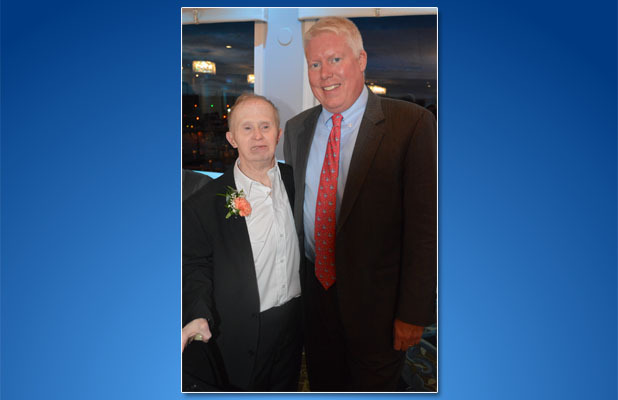 Ducey was honored along with Matthew Redmond, a disable Brick resident who has benefited from The Arc’s services and is affectionately known around town as “Mayor Matt.” Redmond received the organization’s 2018 Heart & Soul Award. He’s also been involved in the community and was honored at a township council meeting last year. The awards ceremony took place at The Arc’s annual “Rock the Night” dinner, which was held last Thursday. The event raised $43,000 for the Ocean County chapter. The Arc’s Ocean County Chapter was established in 1955 with the mission to advocate, provide opportunities and supports necessary for all individuals with intellectual and developmental disabilities to be accepted and valued as citizens of the communities in which they choose to live, learn, work and play. Today, the chapter serves more than 1,500 individuals through residential services, vocational services, and family support services.